With a little artistic license, the scales of features we see in images of solar system objects become far more relatable when we view them in the context of more familiar objects.. Opposite is the asteroid 162173 Ryugu, currently being visited by JAXA's Hyabusa2 spacecraft. The asteroid is only a kilometer (0.6 miles) or so in diameter, but it's still hard to conceptual the size of the rocks, boulders and craters we see on its surface. 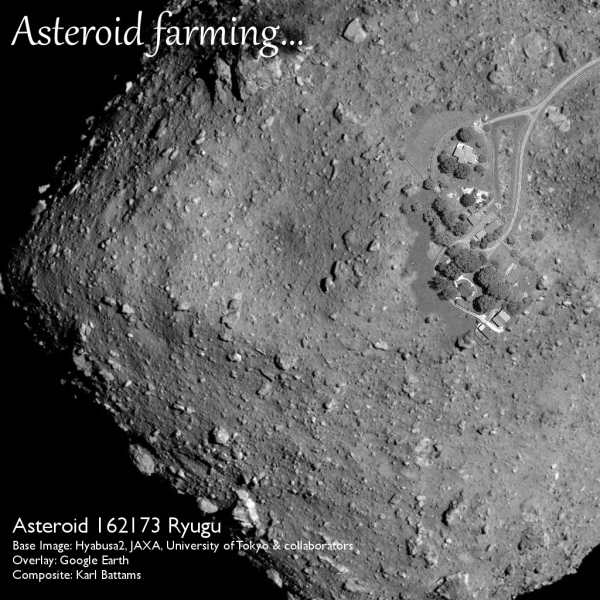 With just a little stretch of the imagination however, we can add a small rural farming scene to the image - to scale, of course - and and make the scale of the asteroid far more relatable. Lots of pretty spacecarft images mean lots of pretty movies!